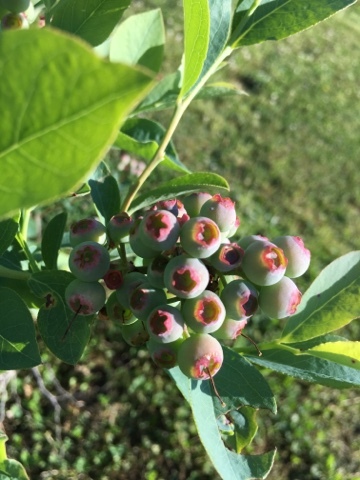 Weekly I hope to give an update on how things are coming along in the garden and our little homestead. Thursdays seem a good day for that since Wednesday is a day that we try to spend a great deal of time in the garden. Yesterday was slightly overcast, but still pretty warm for the first part of May. I'm slightly concerned for a scorching summer, but I am going to just take it a day at a time and be thankful for what each day has to offer. 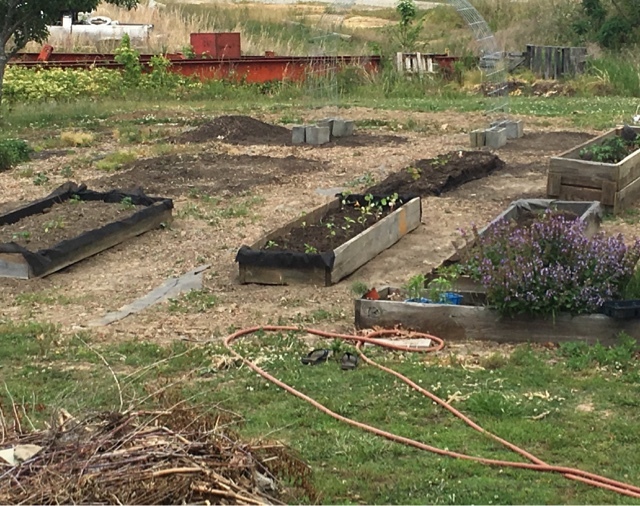 We've decided to redo our garden beds again, last year we noticed some issues and were not happy with the results, so Shannon took the beds apart and we are just reusing all the wood and soil we had. Just a lot of shoveling and rearranging. 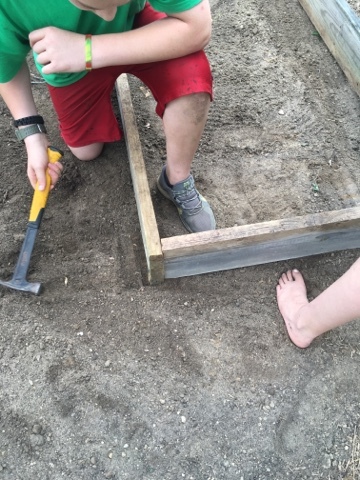 The kids and I managed to make two beds yesterday and get them planted, we hope for several more before the weekend if time allows. We have a lot of things blooming. 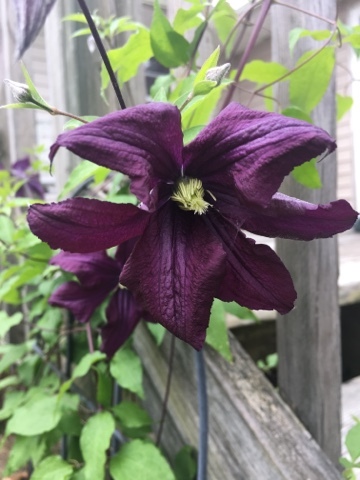 This little clematis was bought on the clearance rack at Lowes last year I think. I've got it on the North side of the deck and it is growing up the stairs. Such a deep dark purple color. 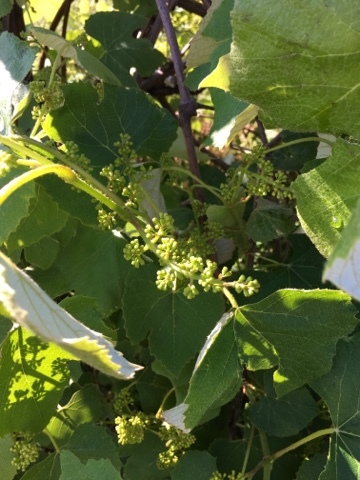 I don't think I have EVER seen so many buds on the grapevine as I have this year. I am truly astounded at the amount. 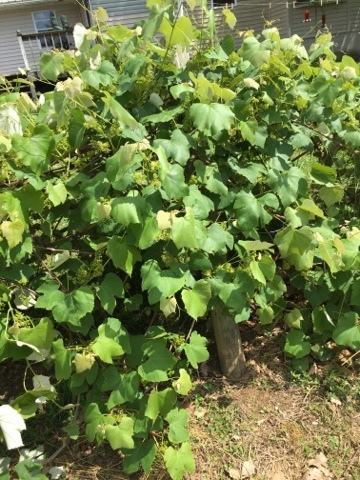 I sure hope we get as many grapes as we can, I want to can a LOT of juice to put up for the winter. My kids have turned into such able helpers. They are an amazing blessing to me and so good to help me get the job done. It's not just teaching them how to do things, it is teaching them how to get in there and get your hands dirty and work. Something this generation seems to have lost. I know there are many more than my family that are raising up great, hardworking kids who will become very responsible adults and for that I am extremely thankful. Now you might want to take notice of the picture coming up next... I am blown away. We have peaches! Peaches that are not falling off the tree. 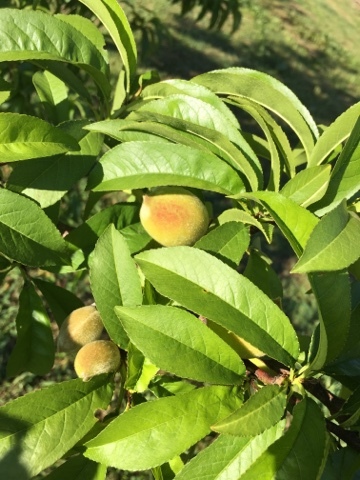 Peaches that are not eaten up by bugs or disease (YET! ), peaches with the slightest peachy blush to it. EEK! 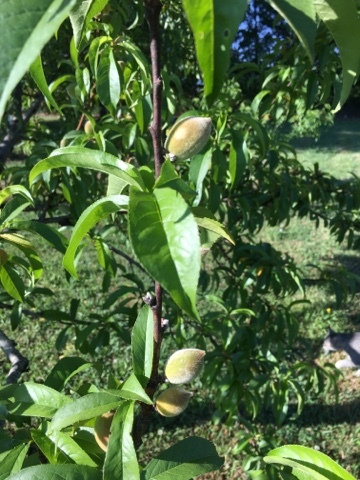 I really, really hope we can get a peach harvest this year! Here are a few more teeny tiny peaches. This picture was taken during our work this morning. That cattle panel trellis will be fixed later on, but we have it staked like that for now to help it to get a little bit of an arch in there. To train it a bit. I can't wait to see it covered with green beans! As you can see in the fire pit, there has been a lot of clean up done around here. And that mound was even after we pulled a lot out for our hugelkultur bed! Another site was this guy. The picture is terrible quality, but we were all AMAZED at how HUGE he was. 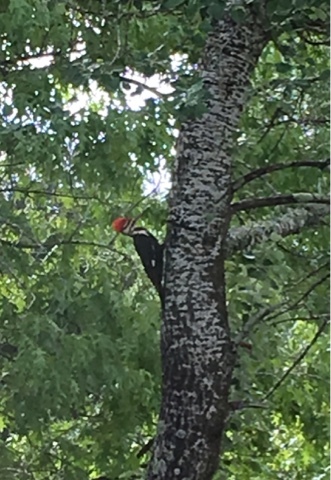 This is a Southern Pileated Woodpecker. I knew we had been hearing him a lot lately and one of the kiddos spotted him and ran straight to get me. They said, "Come look, come look... He's HUGE!!!!!" and they were surely right. This guy was incredible. I love seeing birds that we have never seen before, especially when they are around our house. 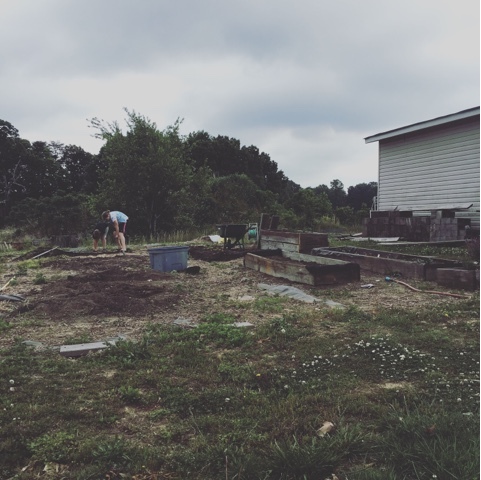 I hope you enjoyed our little garden/homestead update. Looking forward to sharing with you our 2016 garden journey!